Here’s what you need to know about fire-rated glass and framing testing to get started on your next project. What fire-rated glazing tests do I need to be aware of? 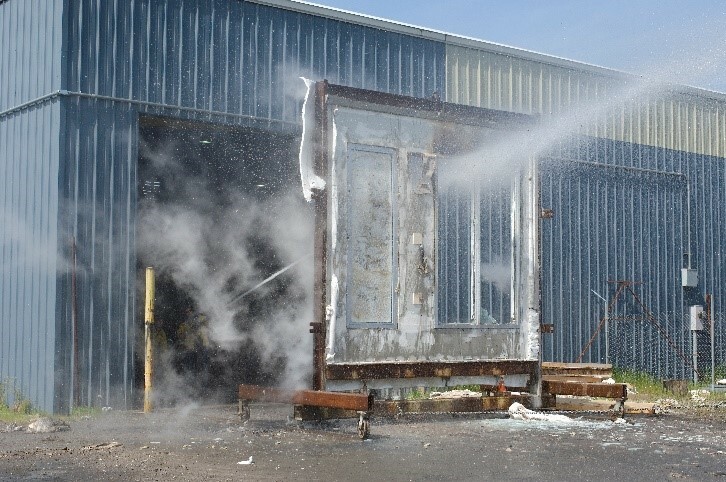 To receive specific ratings required under stringent fire and life safety codes, glazing must undergo a series of tests, including a fire test, hose stream test, and in some cases, impact safety tests. What is the fire test? To receive a fire rating, glass must first pass a fire test in which a large furnace heats window frames or doors holding the glass sample. The assembly must remain intact for the duration of the test; there can be no flaming on the exposed surface of the assembly or openings. How does the required hose stream test work and why does it matter? 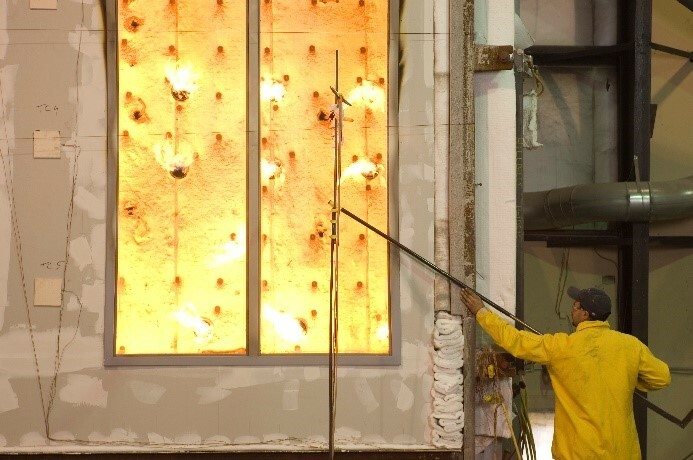 What do I need to know about impact safety testing for fire-rated glazing? 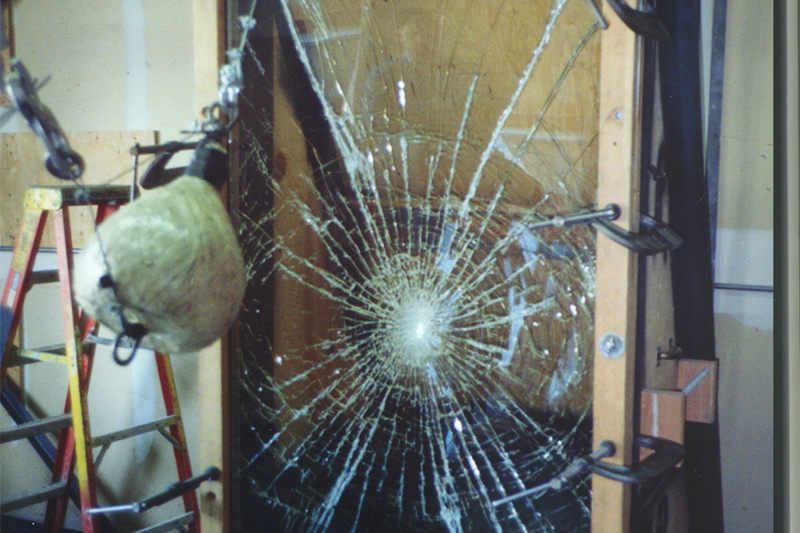 The impact safety test determines whether glass can resist breaking into dangerous shards under various impacts. During this test, a piece of glass is mounted in a vertical frame. A punching “speed” bag is filled with 100 lbs. of lead shot and swung, in pendulum fashion from various heights to impact the glass. A 48-inch drop represents 400 ft. /lb. of impact, and is called “Category II” by the U.S. CPSC (Consumer Products Safety Commission). It is the highest level of required impact safety, representing the impact of a full-grown adult running into the glass. While tempered and laminated safety glass often are used for impact protection, there are numerous products available today that meet this impact rating and also offer high levels of fire protection. An 18-inch drop represents 150 ft. /lb. of impact, and is called “Category I” by the CPSC. Glass that can only meet this test is limited to a maximum size of 9 square feet per lite. The 18-inch drop approximates the impact from an 85 lb. child running into the glass. Can fire-rated glass pass any additional performance tests? Yes, select fire-rated glazing products also have the capability to provide supplemental security protection in a range of applications. For example, bullet-resistant fire-rated glass is available to help delay intruders and prevent tragedies during firearm attacks. 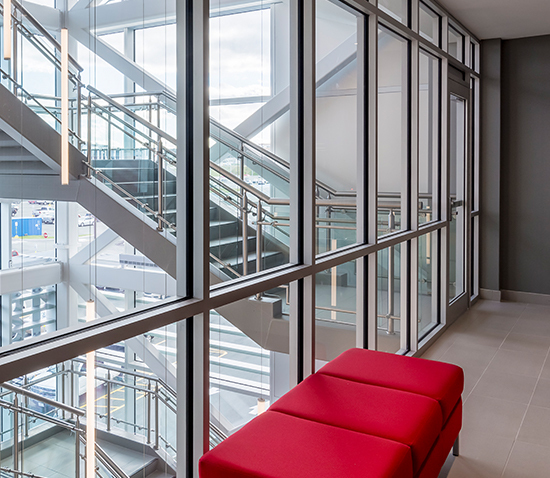 Fire-resistant transparent wall panels are available as a single glazing panel with up to a Level III bullet resistance rating and two-hour fire rating. In addition, fire-rated glass can receive a hurricane rating through tests that determine its ability to remain intact despite impacts from windborne debris. At-a-Glance: Which tests do TGP’s products meet? TGP offers a wide range of fire-rated glass and framing products, including fire-protective and fire-resistive products for any fire-rated glazing application. These include options offering additional performance, including impact resistance, bullet resistance and hurricane resistance. All of our fire-rated products are UL classified and labeled, and pass the mandatory fire test, and most of them also pass the hose stream test and positive pressure tests that simulate air pressure increases during a fire. Our products range from the FireLite® family of clear and wireless, fire-rated ceramics to Pilkington Pyrostop® transparent wall panels and Fireframes® family of fire-rated frames with various finishes, including stainless steel, wood and powder-coating in virtually any color. See TGP’s Product SpeciFIRE® for a fast, free and easy online tool to help you select the right products for your project. For information on test standards met by Fireframes products, please contact TGP.